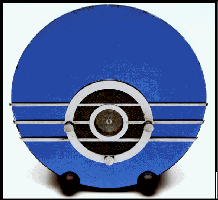 available and new materials and processes allowed products such as this ‘Blue Moon‘ radio help to lift people from the realities of the deep economic and social crisis of the time. Use of the rounded, moulded shapes of new polymers were freeing the constraints imposed by limitations and expense of metal pressings. Designers of the period, - such as Bel Geddes, Henry Dreyfuss, van Doren, Raymond Loewy and Walter Teague were treated as film stars.